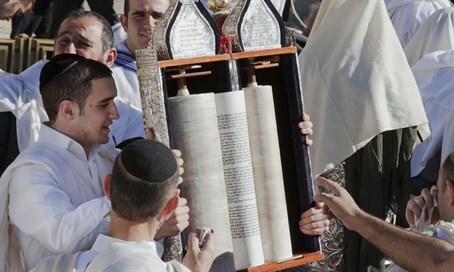 This week's Torah portion: Jews were ordered to destroy the enemies of G-d who seek to destroy them - who are they today? Each generation is faced with Amalek. The Persians (modern day Iran) have been Amalek before. The reading of Megillat Esther is a rabbinic fulfillment of G-d's command "to remember what Amalek did to you, on the way when you were leaving Egypt...You shall not forget" (Beit HaYayin). Haman was a descendant of Amalek, as the Megilla makes perfectly clear. The Megilla was written with this foremost in mind. Prime Minister Binyamin Netanyahu has been Mordechai on this subject. The Republican Party in America recognizes that Ayatollah Khomenei is a Haman clone. Senator Schumer and Senator Menendez recognize this too. Hopefully, more Democrats will come around to a similar conclusion. Perhaps, even Congressman Jerry Nadler when reminded of the Purim Story will change his mind. I also recommend that he read the Parsha of Ki Tetzei over and over again. Perhaps, he will understand better the commandment to "Remember, and to not forget" that Amalek applies to Iran and its proxies today. Even Mordechai lamented the fact that there were Jews in his day who did not see Haman's evil and plan for "the Final Solution". According to the Shelah the reason "to remember" and to "not forget" are both commanded by G-d, relates to two different conditions of the Jewish People. If Israel is as it is nowadays in a position of dominance with freedom to act then it must remember and wage war against Amalek. Yes, one discharges one's Torah obligation by reading the passages about Amalek in Parshat Ki Tetzei annually (Parshat Zachor). However, as Mordechai understood, it is not just enough to read about Amalek but one must confront the Amalek presented in each and every generation. Megillat Easther recounts how Amalek was indeed confronted and defeated. It behooves us all to recognize the Amalek of our generation. If one fails to see Amalek in this generation then one has not fulfilled their true obligation "to remember and to not forget." The Prime Minister of Israel has been on top of this since the get go.